What happens when our brains get overwhelmed? What is the impact on decision making? Today’s behavioral economics podcast is going to focus on these foundational topics. Businesses always ask people to take some sort of action (buy this, click here, download that). It’s a good idea to be careful not to overwhelm your potential customer. An overwhelmed brain will move on and file your business in the “maybe I’ll look at this later” pile. A real life business example of taking care not to overwhelm a potential customer (or in this case listener) is these show notes. I take extra time and expense to have everything laid out in an easy to understand way with all of the related links and studies available for you. That way you can relax and enjoy the show, and if you ever want to learn more or check out the links, you know they will be here waiting for you. I also give more real life and business examples of overwhelm and how it affects the brain and your business. [03:46] I have extensive show notes for every episode, because I want to make it as easy as possible for you to relax, listen to the podcast and still have the resources available (so you don’t have to fill up your brain with the one thing you are trying to remember). [04:57] This is the same reason my strategy sessions are done on Zoom and recorded. I want my clients to be able to be in the moment. [05:50] This is another testament to NUDGES and expecting error. I do not expect that someone will remember every little tidbit they want to from every conversation we have. [06:07] There are two errors here – 1) the inability to remember what was discussed because there is a lot and 2) the inability to really focus in the moment because the conscious brain can only devote so much. [06:32] To combat both of those things, I have show notes and videos to help relieve some of that pressure. [07:45] Participants in a study were asked to memorize a two-digit or a seven-digit number. Participants with the two-digit number were more likely to choose a healthy snack when offered. Those with the seven-digit number? They were more likely to choose chocolate cake. [08:34] Our subconscious brains can process 11 million bits of information per second. Our conscious brain can only do about 40 bits. [08:43] When your conscious brain is focusing on something, it tunes everything else out. [09:01] With your conscious brain occupied, the subconscious is tasked with taking the wheel. It is now running the show. [09:17] Our brains are fueled by rewards like dopamine. [10:23] Just think of all the times your conscious brain is able to get overwhelmed. [10:36] One subconscious rule of thumb is to ignore things that are too complicated. [12:53] Dan Ariely provides a great example of this in his book, The Upside of Irrationality, where giving people an opportunity for a large bonus (5 months salary) severely lessened their ability to perform on somewhat easy tasks. [13:18] The amazing computers in our heads are very easy to bog down. [13:58] Studies have found that those in poverty have reduced cognitive abilities. [14:54] This definitely gets at the core of why it can be hard to break a pattern when you are in it. [15:15] If your brain is overwhelmed…you will probably reach the point of fatigue much faster than you would if you were in a relaxed state. [17:47] I travel quite a bit, but when I am packing for important trips, I tend to do a lot of running through lists in my head, “iPad – check, good shoes – check, toothbrush – check” you know what I mean. This creates an overwhelmed brain. [20:23] Your brain holds more weight and importance on things you write down, so having a physical list you can check off can help really mark it as complete in your brain. [23:53] 1. Write things down – this is like my checklist for packing. [24:52] 2. Do one thing at a time – multitasking is a myth and a path to productive procrastination. [27:38] 3. Make it a pattern (habit) – if there are things you need to do consistently and don’t want to have plagued by overwhelm, turn them into habits. [29:28] 4. Which brings me to the next point…have a goal – hopefully you have already set your 1 to 3 goals for the year after listening to the resolutions episode. [32:41] 5. The final tip is to incorporate constant check ins and breathing points – both for yourself and with customers. Download your free worksheet to help you work through these five steps for yourself and with customers. 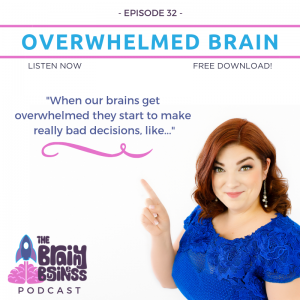 I really enjoyed this episode – it got me thinking not only about how to manage my own overwhelm but how to limit overwhelm for my customers. I have a product based business but its a good reminder that even product descriptions and customisation options can overwhelm customers and cause them not to buy. I’m now thinking about how I can tweak these areas of my website to make it easier and less overwhelming for them. Thank you! I am glad you enjoyed and found value in the episode. And, that is awesome news! I look forward to hearing about how your website refinement project goes and the stellar results you see from the tweaks.